Gutter cleaning is important if you want to maintain your downpipes and gutters unclogged, and protect your property from water damage. Our skilled gutter cleaners will use advanced equipment to guarantee that all leaves, twigs, dirt and other debris are removed properly. A powerful water or dry vacuum cleaner is used. 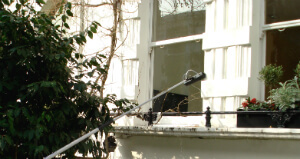 It has telescopic poles with tiny cameras, so that the cleaners can see any debris and remove it. Ashlee House Cleaning offers a month quality guarantee. If your gutters get clogged within 30 days of the cleaning, we will send a team of cleaners to unclog and clean them again for free! We have adequately equipped and skilled roof cleaners who will use effective jet washing equipment to remove lichen, mould, algae, streaky stains and moss from rooftops. House roof cleaning is essential if you want your home to look good, and is also important due to the fact certain detrimental growths can basically “eat” and damage your roof if left un-mended for long. Our service is 100% insured and at a great price! For assistance with cleaning up your roof and gutters, keep in mind to book our general window cleaning service now! We have a straightforward booking system for our window cleaning Queens Road SW8 services. You could pre-book any day of the year for your gutter, window & roof cleaning. We can come on the same day if you want an express service. We have fixed and reasonable rates. All customers who reserve more than 1 of our services at once will be presented a discount for every extra service. No deposit is required to order our cleaning services. We have advantageous fees for regular clients, property companies, landlords and for those of you who book early ahead of time. For a professional window cleaning service, do not be reluctant to contact our 24/7 call center now at 020 3746 1366 or via our online booking form. You will be sent written confirmation in the next Two hours.